Facebook campaigner is a simple and user friendly application that helps you to market your products/services/blogs in 1000s of groups, pages, events, profiles with single click. Getting more and more traffic to your website thus increasing your sales. Create a Campaign in a minute and relax. 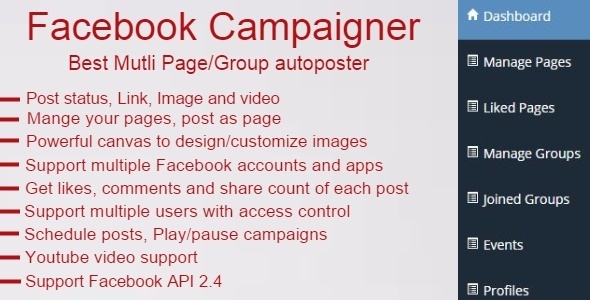 Campaigner will delivers your message to community of millions people by autoposting in selected groups, pages, events, profiles, You can also manage your own pages. You can track the progress of campaign, get the insights(likes, comments, shares) for a campaign, Play/Pause the campaign any time.